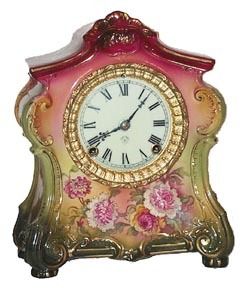 Ansonia Clock Co. Royal Bonn, "LaFontaine", ca 1904. This is a very colorful porcelain case beginning with the dark ruby shades on top, gradually changing to light greens as you near the base. The usual gold accents. Pretty pink, white, green, flowers, on front, sides, and top. American sash, porcelain dial, beveled glass, all perfect. This case is one with a cut out on top. A very delicate piece of porcelain suspended between the sides, and very easily broken, I would think. 8 day, half hour gong strike. 11-1/2 inches high, 9-1/2 inches wide. Properly signed front and back. Ly-Ansonia No. 2595.